An intricate bridal tiara composed with decadence, texture and classic styling in mind. Illuminating in soft silver and ivory tones, this dreamy piece is accented with a pale shade of mushroom. Designed to capture the beauty of delicate lace, this captivating beauty hints at bohemian luxury. 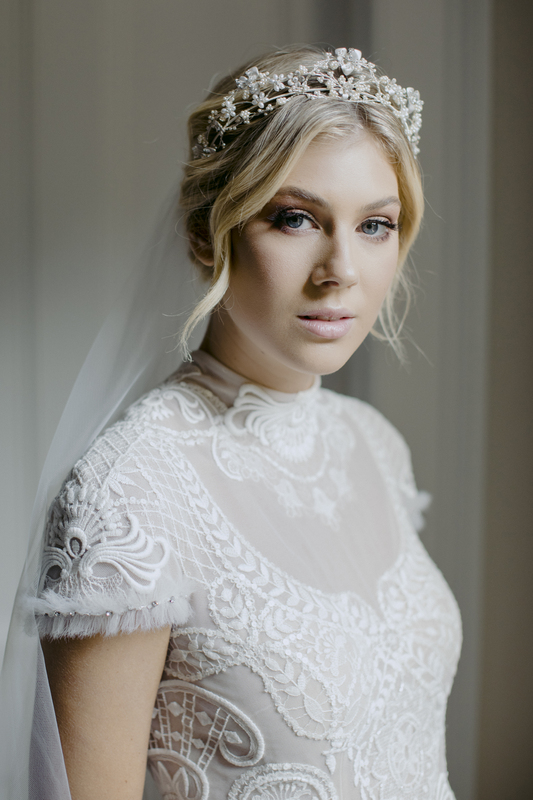 Bohemian luxe meets classic styling – the perfect crown to finish an embroidered lace wedding gown. Featuring Swarovski crystals and pearls, brass findings, Czech seed beads. The Sonnet wedding tiara is made to order. Please allow 4-6 weeks for production plus delivery times. The Sonnet wedding tiara was designed for wedding gowns of refined sophistication. Think ladylike cap sleeves, classic silhouettes, modern and sheer floaty gowns and dresses with a subtle boho vibe. Style it with loose and romantic updos, half up hairstyles and loose relaxed waves. We love how the Sonnet looks in voluminous hairstyles with middle or slightly side parts. The fine metal headband sits neatly against the head and the softly scalloped silhouette sits above the hair in an effortlessly elegant and beautiful way. Pair the Sonnet with a wedding veil, with the veil either secured at the top of the head towards the back or above a low set bridal upstyle. 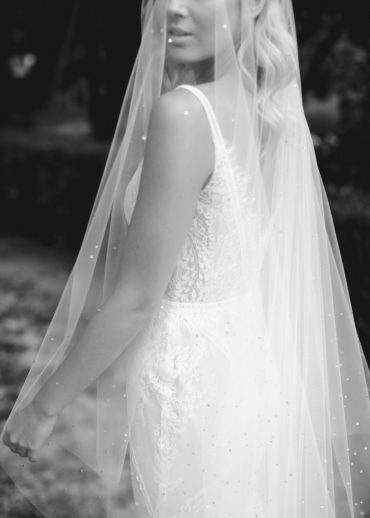 Sonnet can be styled with a full gathered veil or a simpler drop veil in fingertip, chapel or cathedral length. Browse our full veil collection or contact us and we’d be happy to offer a recommendation based on your wedding dress and hairstyle. Finish the look with some light and ethereal drop earrings or simple pearl drops. The details on this crown may be reworked with other details found in the collection. Details can be reworked into a new style – for example, a bridal tiara with a lower profile. Your crown will arrive beautifully packaged in our signature packaging, including care instructions for safe keeping.